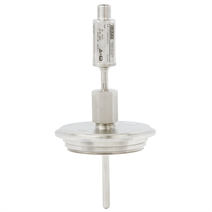 The model TR21-A resistance thermometer provides temperature measurement in sanitary applications and can be used for the measurement of liquid and gaseous media in the range of -30 ... +250 °C (-22 ... +482 °F). For application in hazardous areas, intrinsically safe versions are available. These thermometers are fitted with thermowells, whose process connections meet the stringent requirements, in terms of materials and design, of hygienic measuring points. All electrical components are protected against moisture (IP67 or IP69K). The resistance thermometer is available with direct sensor output or integrated transmitter, which can be configured individually via the PC configuration software WIKAsoft-TT. Measuring range, damping, error signalling per NAMUR NE43 and TAG no. can be adjusted. 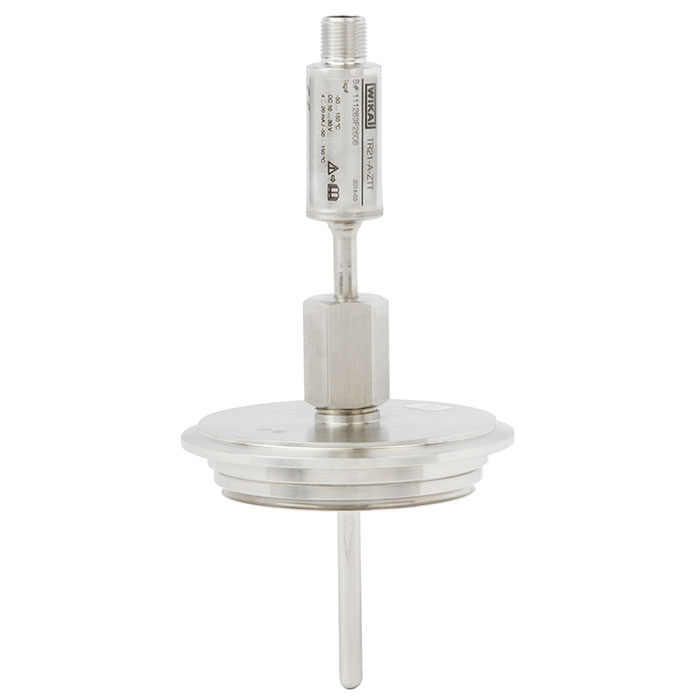 For easy calibration or maintenance, the sensor is removable without having to break into the process or disconnect the electrical connection. Thus hygiene risks can be minimised and downtimes can be reduced. The spring loading, integrated into the union nut, guarantees the contact between the sensor tip and the bottom of the thermowell and thus ensures a short response time and lasting high accuracy. The welded junction between the thermowell and the flange makes the use of a sealing as additional material in those areas redundant which are in contact with the product. Insertion length, process connection, sensor and connection method can each be selected for the respective application within the order information. The electrical connection is made via an M12 x 1 circular connector. For applications requiring the sterilisation of the instrument in autoclaves, an especially temperature-resistant instrument version is available.